Here in the UK our clocks have moved on to British Summer Time. Personally I wish they stayed on BST all through the winter months. It would be great to have that extra daylight into the winter months. The sun is shining down here in London, the mercury has risen and the spring bulbs are bringing bursts of colour everywhere. In the meantime I've been busy getting a project ready for the lovely ladies who are going to be my guests in Barcelona over Easter. I'm so very excited to be hosting them in one of the greatest cities in the world. We're going to be working on some Barcelona Bears as our holiday project. This pattern had its first incarnation to celebrate the wonderful one-day wool fair that is Festiwool back in the autumn, but it's making a come-back with a splendid new spring waistcoat to keep the bear warm in this chilly weather. I've shared the knitting pattern here: Festibear, and if you'd like to learn how to make his waistcoat just read on for my paper pattern and instructions. You could easily make this waistcoat from a fat quarter, or a scrap of tweed with a colourful contrasting lining. Here's the cut-out pattern that I used. 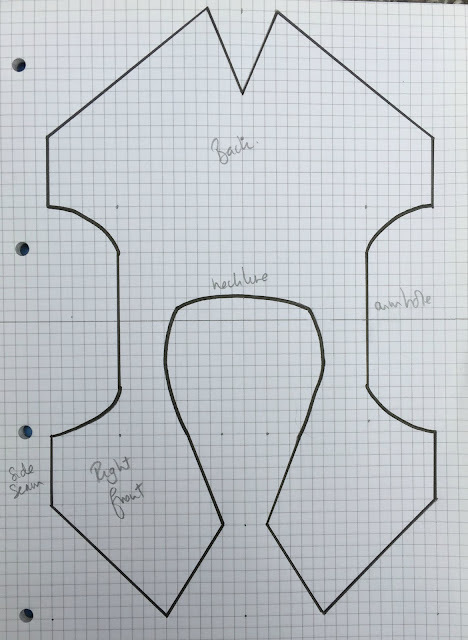 The squares on the paper are 5mm squares if you want to scale a waistcoat of your own. 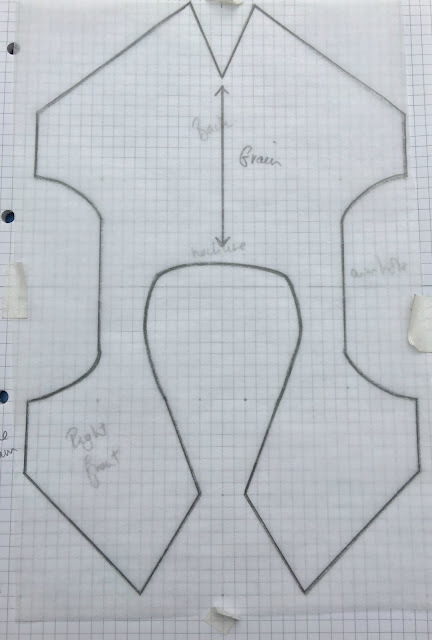 I drew my pattern and then traced it onto some tracing paper, and drew in a grain line running straight along one of the longitudinal lines of the graph paper so that I could pin it straight on the fabric. If you stick your tracing paper onto the pattern page with a little masking tape, which can easily be peeled off afterwards it will help keep it in place whilst you work. Use a nice soft HB pencil that isn't too sharp to trace the lines without tearing the paper. 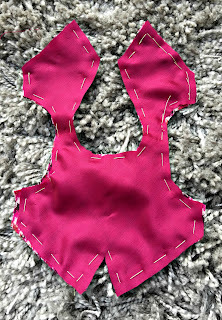 Pin the pattern to your waistcoat outer fabric, and cut it out. Do the same with the lining that you're going to use. Pin the lining to the top fabric, right side to right side and tack together using a 1 cm seam allowance. 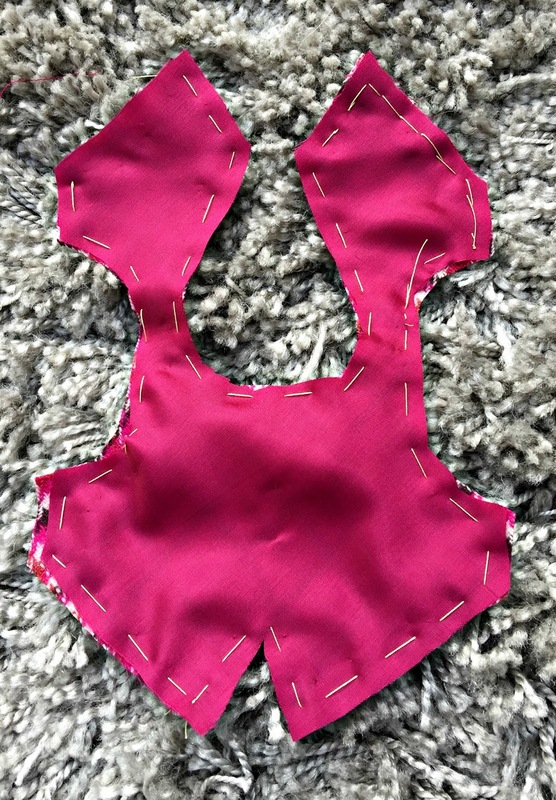 Sew around the outline, leaving the armhole areas unsewn so that you can turn the waistcoat right side out. Top stitch the raw edges, and then turn the waistcoat so that the inner seam is hidden. Turn in the edges along the armholes and finish them off by hand. Sew up the side seams by hand using a whip stitch, and you're done! Oh, so cute! We have what we call Daylight Savings Time, and moved an hour ahead a couple weeks ago. The one thing I don't like about it is school kids about need to go to bed while it is still daylight!